Soaring above a maze of red canyons, the Fisher Towers are a… – Sig Nordal, Jr.
February 24, 2018 February 25, 2018 Sig Nordal, Jr. 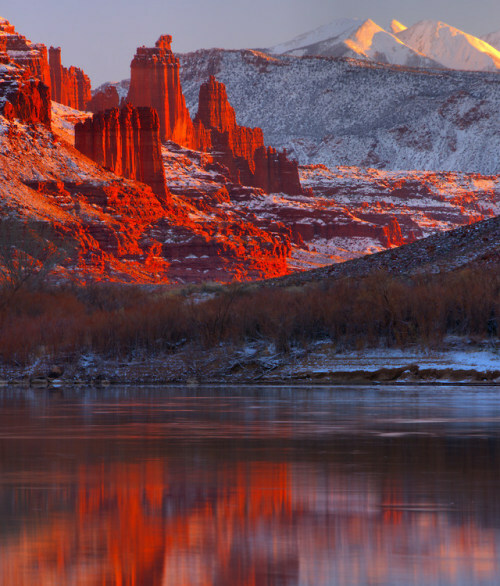 Soaring above a maze of red canyons, the Fisher Towers are a dramatic sight along the Colorado River in Utah. A National Scenic Trail winds 2.2 miles around the stone pinnacles and climbs up to nearly 360 degree views. Experienced climbers can test their skills on the rock faces while less daring visitors can enjoy relaxing moments at the nearby Bureau of Land Management campsite. Pro-tip: clear nights offer incredible stargazing opportunities. Photo by Adam Jewell (www.sharetheexperience.org).